Shrimp is one of the easiest protein sources to cook out there! All you need is a couple minutes-seriously! One shrimp normally cooks in less than 30 seconds. 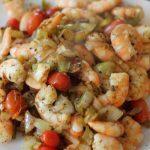 Make a whole batch of this yummy shrimp and veggies in less than 10 minutes! All you need for this simple meal is a pot, olive oil, shrimp and the veggies. Don’t forget to season with salt and pepper! I recommend getting your shrimp peeled and deveined. You can always do this at home. If you don’t want to devein the shrimp, that’s fine too! I would recommend having them peeled at least, though. This is so simple that you can whip it up during the week for lunch. Try it out! This one pot shrimp and veggies recipe is super simple! You can even mix it up by using your favorite veggies or whatever you have in your fridge. If your shrimp didn't come peeled and deveined, do this first! That way you have them all ready when it's time to cook. Prep your veggies. Dice the onion into bite-sized, 1/2 inch pieces. Do the same with the bell pepper and celery. Half or quarter your cherry tomatoes, depending on how you like them. In a saute pan, add the olive oil or cooking spray over medium-high heat. Add in the prepped onion first and let it sweat out a bit. Next, add the celery and bell pepper and wait until they soften a little too. Lastly, add the cherry tomatoes. Now turn down the heat to medium and add the garlic last. I like to add garlic last on a lower setting because it scorches very fast. We aren't trying to burn or toast the garlic here. We want the aroma and semi-cooked garlic, for flavor. Once you can smell the garlic, time to add in the shrimp. Shrimp cooks very quickly so I would set your timer for a minute, flip, then add one more minute. Make sure not to overcook! Shrimp get that rubbery texture when they are over cooked. Season well with salt and pepper! You'll know your shrimp is done when they are completely pink and semi-firm when you press the middle. Serve and enjoy! Previous articleCrock Pot Apple Sauce. Homemade and Preservative Free!